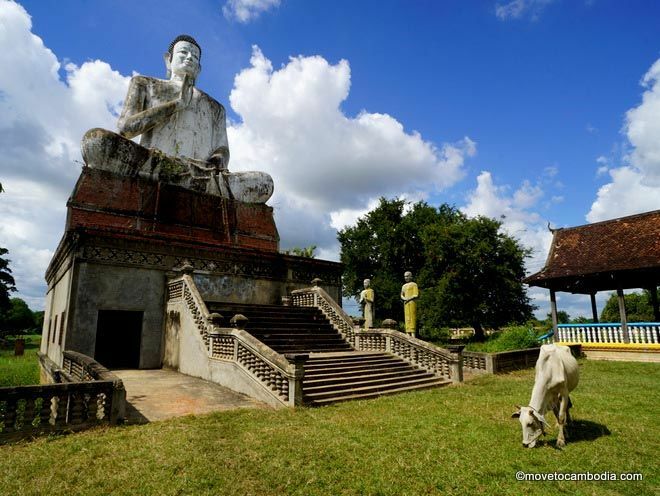 A walk around Kampot’s historic center offers unique shopping opportunities. 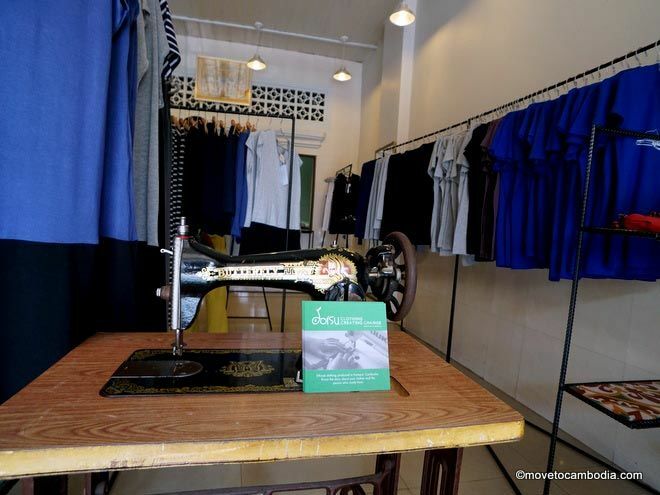 Dorsu sells ethical, locally produced clothing, including a nice range of women’s basic cotton and jersey tops and dresses and unisex T-shirts. And yes, they have Western sizes! Prices are reasonable and many of the items are made in the shop by staff who are fairly compensated and whose names appear on the label of each item they sew. They even have a seamstress working in the shop (to show the non-sweatshop conditions, we assume) who can custom tailor the off-the-rack clothing for sale in the store. Dorsu specializes in ethically made cotton clothing, and yes, they will fit you. KAMA (Kampot Arts & Music Association) has a shop in Kampot where they sell Cambodian Space Project art prints — we have a few ourselves, purchased at their Phnom Penh shop, and they are very cool. But we’ve tried to visit the Kampot store on three separate trips there and they’ve never been open. It’s also a live music venue and cafe as well as a community arts initiative, so we’re sure it’s worth a visit and will keep trying. Next to Epic Arts Cafe is Epic Creations, a small shop run by the Epic Arts NGO team that is filled with all sorts of things that you’ll feel like you need, made by Epic Arts and other like-minded local organizations and artists. A favorite is their line of ‘Khmicons’ T-shirts featuring such Cambodian idols as Sinn Sisamouth, Pan Ron, and King Father Norodom Sihanouk. They also carry locally made and ethically produced toys, jewelry, and decor, as well as many compelling items from Trunkh., Cambodia’s first art-concept store. Epic Creations is a great place to shop for the sort of souvenirs you won’t find anywhere else in town, while supporting a wonderful organization at the same time. The tiny pillows are not the main draw of Tiny Kampot Pillows, but rather, the large selection of cool souvenirs. On the other side of the 2000 roundabout is Tiny Kampot Pillows, an eclectic shop selling small pillows (tiny might be a stretch), scarves, Kampot pepper, local salt, greeting cards, and various other locally produced souvenirs. They also have an interesting selection of products made out of the traditional Cambodian krama, including boxer shorts, pillowcases, and patchwork quilts. Sometimes they have herbs for sale outside as well. 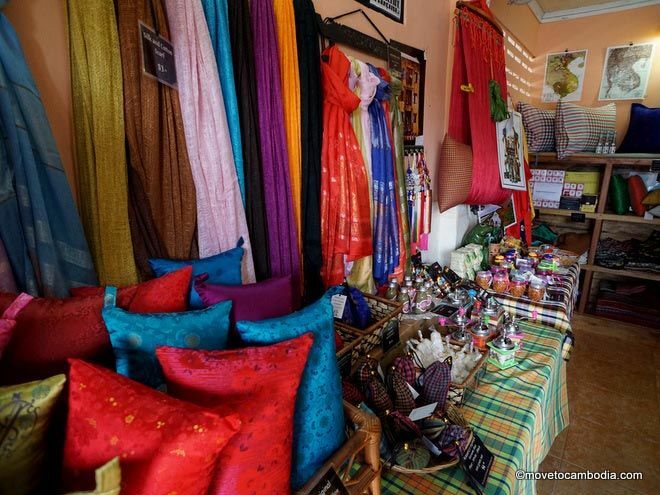 Even if you’re not specifically in the market for anything, Tiny Kampot Pillows is worth visiting just to see what they have and to chat with the friendly Cambodian owner. If it’s Kampot pepper you are after, head straight to The Kampot Pepper Shop. While the less expensive pepper you can get in the market and from many shops is “imposter” Kampot pepper, ie. not high quality and not grown locally, The Kampot Pepper Shop sells only real organic Kampot pepper that they grow themselves, at Bo Tree Farm. They are known to have some of the highest quality pepper around, and export most of what they grow to Europe where it’s served in Michelin-starred restaurants. 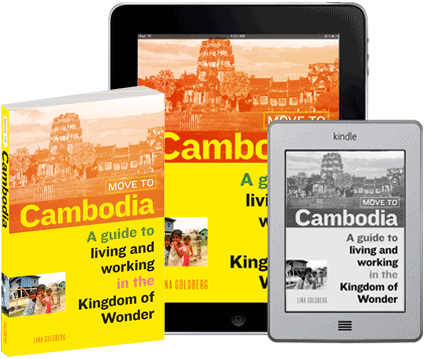 Find a book for the long journey home at Kampot’s finest. 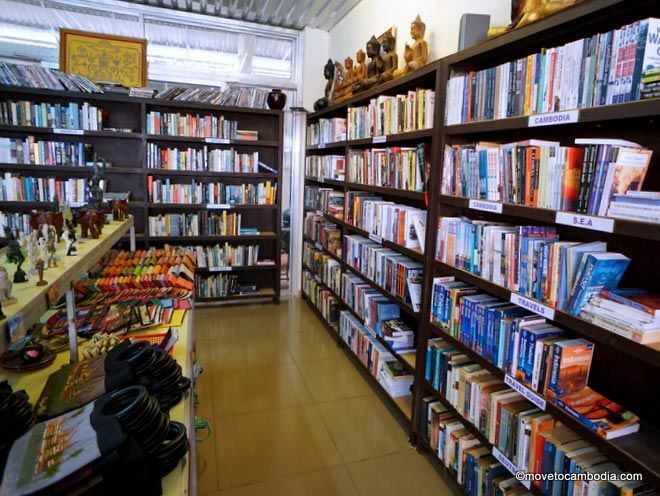 Kepler’s Books is a bookstore and souvenir shop that sells a range of mostly used volumes, as well as a selection of pirated, Xeroxed books, including a few best-sellers and Cambodia-oriented titles. Most are in English, but they have a small selection of European-language books. We were pleased to see that Move to Cambodia is part of their pirated collection — if that isn’t success, we don’t know what is. They also have a stock of Kampot pepper and other random knick-knacks. Psar Samaki is Kampot’s traditional market, selling a little bit of everything that you might need if you’re living in Kampot. They also have a few pepper stands where you can buy Kampot pepper in bulk, for much less than the souvenir shops in town. If you’re looking for a low-cost Cambodian gift, check out the matching pajama daywear that are popular with the locals. Open daily, 9 a.m. to 7 p.m.
Open daily, 10 a.m. to 7 p.m.